I've read my fair share of Jennifer L. Armentrout books (and we all know she has a ton - I'm starting to think that she writes even while she's sleeping or something), but I wouldn't exactly call them favorites. They're entertaining enough, sure, but I've always thought that they lacked a little something that would put them well above the pack. Despite all this, however, I was really excited to read White Hot Kiss. A fair share of bloggers whom I follow have all professed their undying love for it and proclaimed it as the best book JLA has written so far, and as a result, I had to see whether that was true. Also, the premise is nothing short of enticing - demons? gargoyles? wardens? Yup, I was pretty much sold. And... I think this is one of the few times wherein I book I read has lived up to all the hype surrounding it. Also, yes, I do think that White Hot Kiss is indeed JLA's best book to date! JLA did such an amazing job in portraying her female MC, Layla. She's likeable, a character you want to know more about, and a character you just can't help but root for. Layla is half Warden and half-demon, but because she was raised amongst Wardens, (and demons are the Wardens' sworn enemies), Layla was taught to hate half of who she is. Can you imagine that - being raised to hate half of who you are? She was taught to embrace only her Warden half and does everything that she can to stamp out the demon blood running through her veins. Also, despite living with the Wardens all her life, she is, and will always be, considered an outsider. She is ostracized, ignored, and openly considered to be dangerous by the very people she has known all her life. Not only is Layla going through the normal identity crisis that all teens experience, she is also struggling to find out which side of herself she should embrace. Should she continue living as a Warden, or should she give her demon half a chance? The plot mostly centered around Layla and her search for acceptance, as well as her desire to belong somewhere. All her life, she considered herself a Warden. She has helped kill demons for years now, and her closest ally, Zayne, is a Warden too. While Layla's home life isn't exactly full of sunshine and roses, she's always had Zayne by her side so when Zayne starts to seemingly have no time for her anymore, Layla feels more alone than ever. Not only that, Layla also realizes that there are now demons who seem to know who she is and who want to kill her. All in all, Layla is confused, lost, and alone... and suddenly, here comes a demon named Roth who not only saves her, but also introduces her to everything she was forced to hate in the past. Roth is everything that Layla was taught to be afraid of, and at the same time, he was what the Wardens were trained to kill. At the same time, however, Roth is also the only guy Layla currently knows that she won't accidentally kill should she kiss him. Ho-hum! The way the romance between Roth and Layla played out is classic Armentrout - the chemistry is definitely there (and believe me, the chemistry is all sorts of intense), and Roth's sharp retorts and witty one-liners sure do keep things interesting. 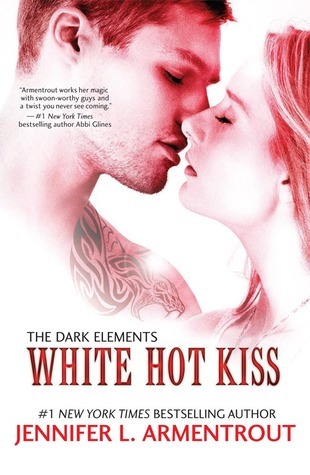 What I liked most about White Hot Kiss' romance angle was how Roth continuously teaches Layla that things aren't quite black and white, and that nothing is as simple as it ever seems. He encourages her to embrace absolutely everything about herself, and to ultimately embrace her strength and her special abilities. The story was well-paced. It was action-packed, yes, but that didn't distract from Layla's search for acceptance and belongingness, which I consider the biggest plot point of the book. As I have previously mentioned, I also love the romance and how it complements Layla's journey. The world building was spot on. I didn't have the chance to read the prequel, Bitter Sweet Love, before I started White Hot Kiss but Armentrout's world was easy to soak in and get lost into. I can't wait for JLA to explore this world more in the succeeding books of this series! Perhaps the one thing that I'm a bit iffy about is how JLA is setting up a love triangle between Layla, Roth, and Zayne. Don't get me wrong - I love Layla's relationship with Zayne. I love the easy camaraderie they share, and I just adore how comfortable they are with each other. Heck, I even love how JLA portrayed Layla's love for Zayne. It was genuine, and in those scenes, you really feel for Layla. Anyway, as I was saying, throughout the book, Layla struggles through her feelings for Zayne, which she assumes to be romantic love, but I believe otherwise. I really wish that JLA can just focus on the friendship developed for a good number of years between the two, instead of making everyone go "Team Roth!" or "Team Zayne!" All in all, White Hot Kiss surprised me... in a good way. This is one JLA book that definitely deserves that 'favorite' label!